A man who attacked a teenage boy with a hedgehog has been fined by a New Zealand court. William Singalargh, 27, had asked his victim if he wanted to "wear a hedgehog helmet" before hurling the animal at the 15-year-old on 9 February. Police said the boy was hit in the leg, causing a large, red welt and puncture marks in the confrontation the North Island city of Whakatane. Singalargh was convicted of assault and offensive behaviour. . . . It was unclear whether the hedgehog was still alive when it was thrown, though police said it was dead when collected as evidence. Dieter Meier and Reiner Klose, both 18, had abandoned a stolen car and run into thick forests after being chased by cops in the Mecklenburg-Western Pomerania region. They managed to lose the officers and planned to wait until the next morning but were charged at by a herd of wild boar. They climbed up a tree but the animals would not go away and eventually they had to call police. They were immediately arrested and charged with theft. A police spokesman said: "They were petrified by the boar. They decided arrest was better than the pigs." A Prineville [OR] man arrested Friday for numerous wildlife-related crimes in what one trooper described as a "serial-type killing of wildlife." In August 2007, the OSP department aircraft helped locate a suspect spotlighting in the general area where these deer were found. OSP Fish & Wildlife troopers contacted the suspect identified as 60-year old Ronald A. Livermore of Prineville. . . .
Investigators believe Livermore, who admits he is primarily a vegetarian, would usually drive around in the darkness shining his spotlight, and when he saw eyes he would just shoot at them and then drive on looking for more. Tanzania's President Jakaya Kikwete has condemned witchdoctors who kill albinos and harvest their body parts in the hope it will bring prosperity. He said 19 albinos had been murdered since March 2007, and another two were missing presumed dead in the east African country. Police in Norway are looking for a thief who walked unnoticed out of an aquarium carrying a crocodile. I wonder if there's any way people could be sentenced to 6-10 months of unremitting headaches? Sophisticated submarine-like boats are the latest tool drug runners are using to bring cocaine north from Colombia, U.S. officials say. Although the vessels were once viewed as a quirky sideshow in the drug war, they are becoming faster, more seaworthy, and capable of carrying bigger loads of drugs than earlier models, according to those charged with catching them. "They tend to be one of a kind," U.S. Coast Guard Commandant Thad Allen said. "They cost up to a million dollars to produce. Sometimes they are put together in pieces and then reassembled in other locations. They're very difficult to locate." The boats are built in the Colombian jungle. They sail largely beneath the surface of the water but cannot submerge completely like a true submarine. 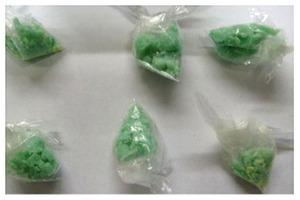 On St. Patrick's Day, Ohio cops seized crack cocaine that had been dyed green, apparently in recognition of the holiday. . . . The emerald green crack was packaged in small plastic bags. Asked by TSG if he had ever seen drugs marketed in such a fashion, [Washington County Sheriff Larry] Mincks said that several years ago some dealers used food coloring to dye their crack red during the Christmas season. A pair of bank robbers burst into tears and collapsed choking in Poland after they tried to use pepper spray on a cashier in front of an air conditioning unit. The wind blew the spray back over the pair, who staggered from the bank in the south-western city of Wroclaw empty handed. The mysterious feet that have been washing up on islands in the Strait of Georgia [British Columbia] could have drifted in from as far as 1,000 miles away, according to an expert on ocean currents. "That's the range they will have to consider when attempting to identify the victims. They could easily have come that far from California or Alaska," Curtis Ebbesmeyer said Friday from his home in Seattle. "I suppose they could even have come from Japan, because things do drift in from that distance, too," he said. Ebbesmeyer is an expert on drifting objects and has assisted investigations in Washington state when body parts were found in the ocean or washed ashore. The Royal Canadian Mounted Police (RCMP) and the British Columbia Coroners Service are investigating three cases of washed-up right feet inside running shoes. The latest was discovered on a beach on the east side of Valdes Island on Feb. 8. The first foot was found washed ashore on Jedediah Island on Aug. 20, and six days later a second was found on Gabriola Island. Both were in size-12 runners. No information on the size of the shoe of the third foot has been released.